My husband and I recently celebrated our ninth wedding anniversary and were lucky to have a weekend in Pemberton to indulge in decadent food, memorable adventures and absolutely blissful downtime. We packed a lot of fun into our time there, from road biking and hot tubbing to fine dining and trail riding, and fell in love with this little village that we previously hadn’t known. One more reason to love Pemberton: it’s generally warmer and drier in Pemberton than in Vancouver. That was definitely the case when were there and if next summer is anything like this past one in Vancouver you’ll find me heading up to Pemberton to seek some sun and solitude, with a splash of adventure, as often as possible. We brought our road bikes up from Vancouver so we could have some fun, get some exercise, take in the stunning scenery and counteract the staggering amount of calories we were about to enjoy. After a two-day stopover to visit our best friends in Whistler on our way to Pemberton, the four of us headed up to Pemberton from Whistler on Saturday morning. 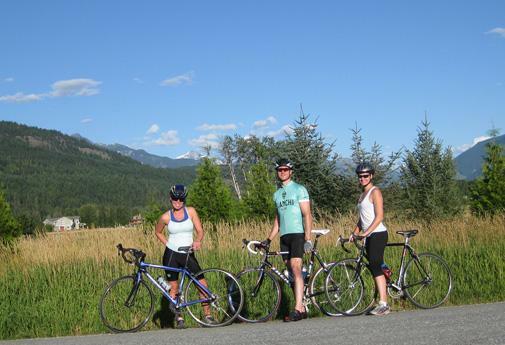 The guys rode their bikes all the way up and us gals drove up to our meeting point at the start of Pemberton Meadows Road, a flat, gently meandering 45 kilometre stretch of road with picturesque views of grazing cows, working farms, and the stunning backdrop of snowcapped mountains. 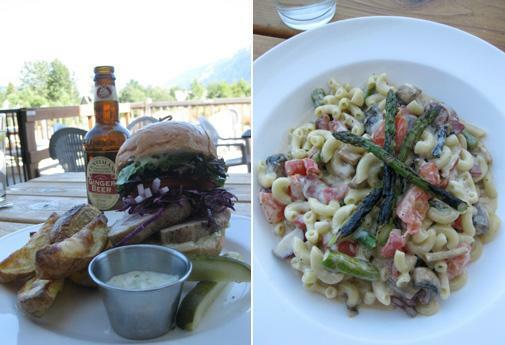 After our bike ride it was time for the two of us to check into the Pemberton Valley Lodge, just off Highway 99, and get ready for dinner. We were pleasantly surprised by how nice our accommodations were: we had a gorgeous one-bedroom suite with lots of amenities including in-suite laundry, a full kitchen and dining room, a living room with a fireplace and TV, and a cozy bedroom. Maybe I’ve been staying in the wrong places but my beef with most hotels is the bedding. 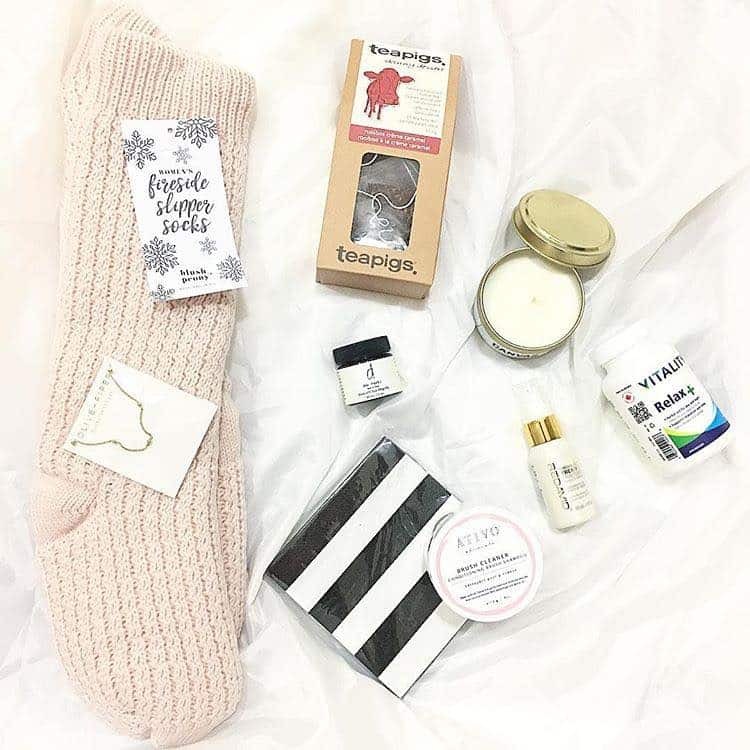 The flimsy little blankets and scratchy quilts just don’t do it for me. 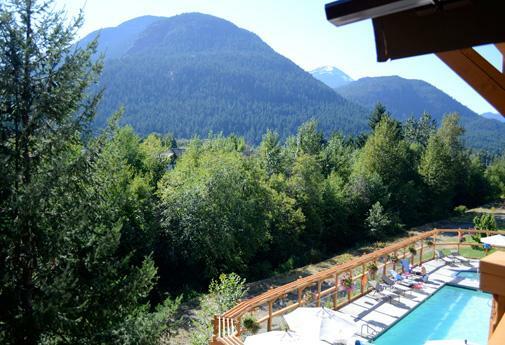 The Pemberton Valley Lodge was just like home with a comfy down duvet and substantial pillows – and even better than home because the bedroom was dark, quiet and had a TV. Another nice touch was the iPhone docking station which I was excited to discover after forgetting my cell phone charger at home. But the highlight was the gorgeous pool deck, of which he had a wonderful view of from the private balcony in our suite. Set behind the hotel against the trees, it’s a peaceful oasis to soak up the sun on the lounge chairs, take a dip in the pool, sooth your muscles in the hot tub or dine al fresco with the BBQs available to guests. The Lodge is also a pet friendly hotel and allows dogs up to 75 pounds for an additional fee of $45 per stay. 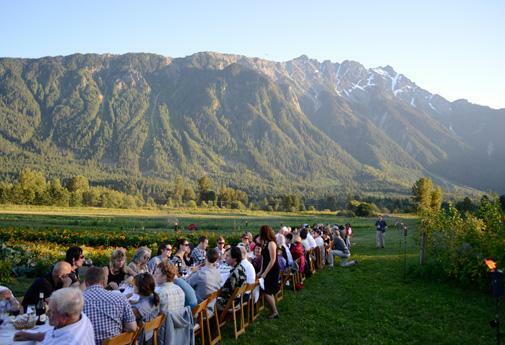 One of the most incredible dining experiences we’ve ever had was at the inaugural Araxi Longtable at North Arm Farm, a 60-acre organic farm about 5 kilometres east of Pemberton. The event is called a longtable because about 120 friends and strangers sit at one, long table to enjoy a truly memorable communal dining experience. Whistler’s Araxi was the first restaurant in the highly celebrated Top Table Group’s family of restaurants, which now includes Vancouver’s CinCin, Blue Water Cafe, West, and Thierry. Executive chef James Walt took the helm in 1997 and has been working with Jordan Sturdy, North Arm Farm’s owner, and other local producers since then to provide Araxi’s customers with fresh, local, seasonal and sustainable food. Chef Walt is very much involved in the Pemberton community and is a great ambassador for, and leader in, its environmentally forward thinking. The Longtable’s menu – slightly different for each of the three events throughout the summer – closely follows the farm-to-table philosophy with most of the produce coming from North Arm Farm and the proteins from locally raised beef and locally caught seafood. After such an eventful day, a soak in the hot tub, gazing at the stars was the perfect way to wind down. The Lodge’s hot tub is open until 11pm (and is adult-only from 9pm to 11pm). On Sunday morning we awoke to a sunny and spectacularly clear day, and headed off to the Big Sky Golf and Country Club for breakfast at Fescue’s. We missed the breakfast rush of early-bird golfers by sleeping in and had the whole patio to ourselves. 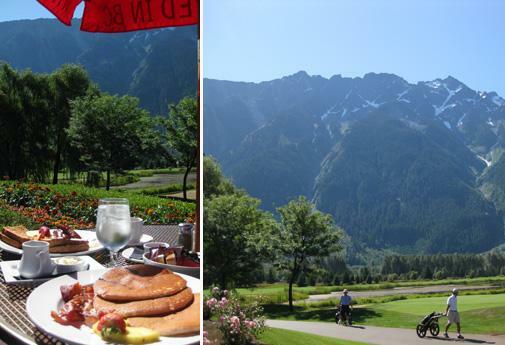 As with many of our experiences in Pemberton, the backdrop for our breakfast was so magnificent that it ran the risk of appearing fake in pictures taken to capture the moment. We had delicious coffee and freshly-squeezed orange juice and a nice, hearty breakfast. We shared the Traditional Big Sky Breakfast, $11.95 with two eggs, home-style potatoes, toast, fresh fruit, and bacon, sausage or ham, and the Stack of Pancakes, $10.95, with three big pancakes, fresh fruit and bacon. 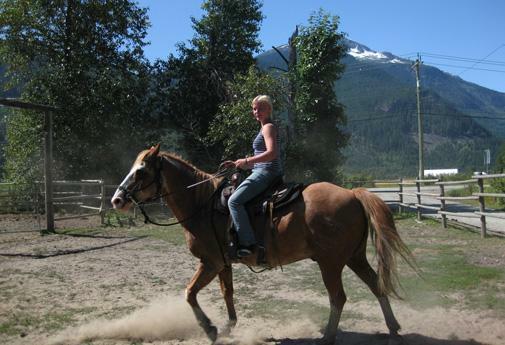 I hadn’t been on a horse since my high school days at horse camp and my husband had never been on a horse in his life, so we jumped at the chance to join a one-hour trail ride with Pemberton Stables. Our guide, a friendly young gal who’d just arrived from Germany, and a newlywed couple along with my husband and I set out on a leisurely ride through beautiful meadows and wooded trails. Fortunately for my husband, his horse, Al, was a bit naughty so he was able to try some extra maneuvering and trotting to catch up to the rest of the group once he’d convinced Al to stop eating the tantalizing but off-limits oats we had to pass. After our trail ride we headed back to town for lunch and made our way to Mile One Eating House. I hadn’t realized that Pemberton was such a hot spot for locavores, and Mile One’s owner, Randy Jones, is one of them. Jones is passionate about responsibly-sourced, local ingredients – like the west coast tuna for my sandwich, the venison for my husband’s mac and cheese, and the Pemberton Meadows Natural Beef in all of the delicious burgers. Mile One also has a retail area with local products like birch syrup, birch BBQ sauce, and local salt from the Vancouver Island Salt Co..
We sat out on the huge patio to eat our lunch. I had the scrumptious Seared Rare West Coast Albacore Tuna sandwich, $12, which comes on a bun from local Blackbird Bakery with purple cabbage slaw and wasabi mayo, plus the Roasted Yukon Gold Potato Wedges, $2.50. My husband had the decadent and hearty Wild and Tame mac and cheese, $13, with mushrooms, venison sausage, vine ripened tomato and grilled asparagus. On your way in or out, don’t miss the giant map of the Pemberton area at the front of the restaurant. Jones says that customers sometimes pop in just to take a look at the map and he’s always happy to talk about his favourite spots in the area (he gave us some great ideas for our next camping and hiking trips). Just like chef Walt, Jones takes a lot of pride in his community and is a great advocate for eating well and enjoying the great outdoors. The weather was absolutely perfect the entire weekend and Sunday afternoon was clear, sunny and hot – all you could ask for when passing time in a comfy lounge chair by the pool. We were supposed to return home to Vancouver on Sunday evening but we were having such a wonderful time that we decided to stay another night. I imagine that many of the guests had headed back home for the start of the work week because we had a good stretch of time with the whole pool deck to ourselves. Peace, quiet, hot sun and my favourite person on earth at my side. Absolute bliss. After our lazy afternoon, it was time for a little exercise. We headed to One Mile Lake for a stroll around the boardwalk and trail. 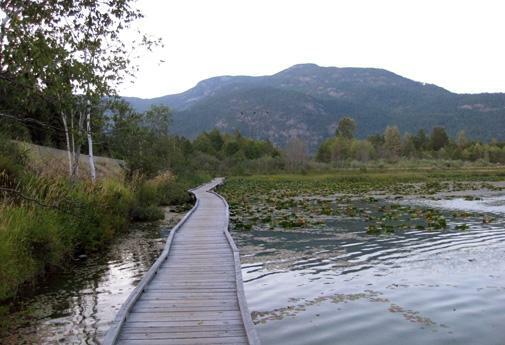 It was so idyllic and peaceful, with lily pads and the mountains in the background, and was a very easy walk. Even though we had a full kitchen in our in our room and a BBQ available to us on the pool deck, we opted for pizza instead of making dinner, and watched TV in bed, a luxury we don't have at home. 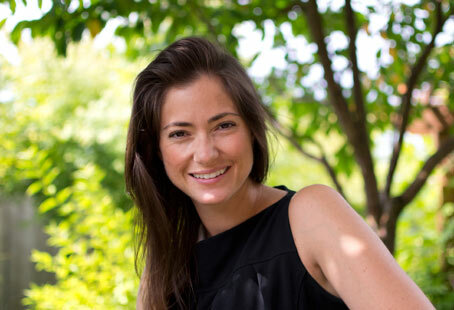 Catherine Roscoe Barr, BSc Neuroscience, is a Vancouver-based writer, editor, and fitness professional. Before settling on the west coast she lived in Sydney, Toronto, Oregon, Montana, and practically everywhere in Alberta. 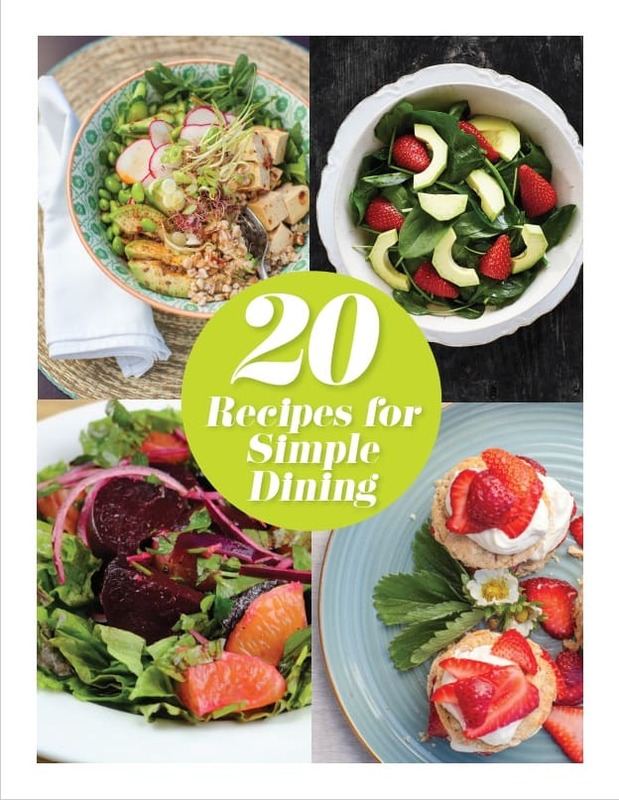 She can be found jogging with her adorable dog, dining with her fabulous husband or voraciously reading anywhere comfy.